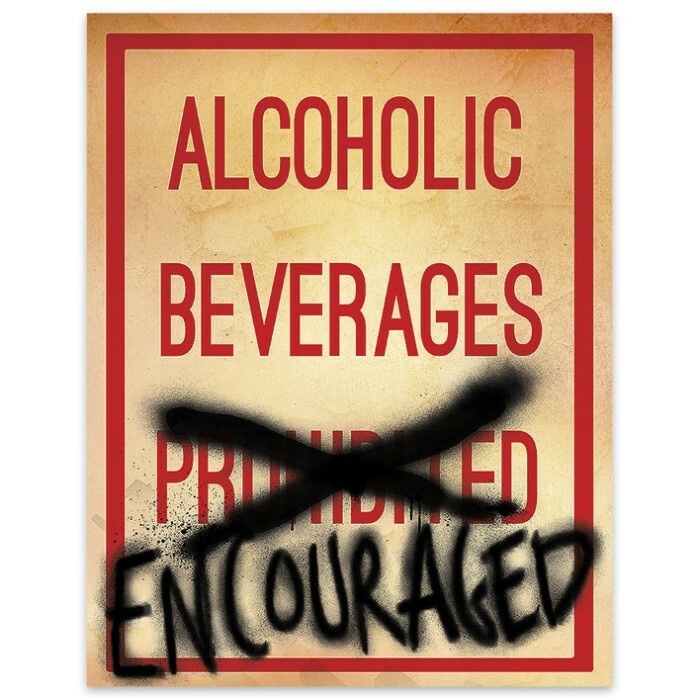 Alcoholic Beverages Encouraged Metal Warning Sign | BUDK.com - Knives & Swords At The Lowest Prices! Are your graffiti and vandalism days behind you? Do you sometimes secretly yearn to relive those wild, trouble-making years of youth, but fear jail or fines as an adult? Here's your sign... A hilariously defaced play on a classic municipal placard, this funny tin sign is perfect for man caves, garages, kitchens, cabins, living rooms or anywhere else alcoholic beverages flow plentifully! It's made of durable, corrosion resistant metal and features vibrant, fade resistant inks. Makes a great, amusing gift.